Above quote precisely explains one such disruption in the world of fintech, cryptocurrency. Although many of us hear and talk about the potential revolutionary impact of blockchain technology in the future, only a few of us know about how it actually works. And when we do not understand something, the confusion and uncertainty can lead to chaos. But you need not understand the complexities of this technology to use it unless you want to work in blockchain application development companies as a developer. In fact, many of us are already using it in the form of cryptocurrency. As “Bitcoin” gained prominence in 2017-18, every prominent cryptocurrency development company came up with its own offering like “Ripple”, “Tron”, “Monero” and “Ethereum” etc. It is also very easy to misunderstand that you use all the cryptocurrencies for the same purpose. But let us understand the difference between two cryptocurrencies with examples of Bitcoin and Ethereum. We use a Bitcoin blockchain as an alternate currency (or digital currency) whereas Ethereum blockchain has its own currency vehicle called Ether which the smart contract development services use to buy the computational ability to run their codes (or peer-to-peer smart contracts). Amidst all these developments, one cannot ignore the compliance corresponding to the cryptocurrency. This piece of writing is going to focus on the same, i.e. Taxes. As acceptance for the Bitcoin saw momentum in the form of currency, so much so that platforms like Coinbase started to serve as exchanges for Bitcoin to convert it in fiat cash (even in US$), the government also observed a surge in black market trading involving Bitcoin and this could not have been ignored for a very long time. Today, we can expect that more people will be reporting their crypto holdings this year against last year, but still, there are many people who are unclear about tax filing on crypto holdings. It is because of the highly confused status of virtual currencies. As per IRS Notice 2014-21, the virtual currencies are defined as property. This means that anything which you purchase using an asset (virtual currency in this case) is liable for taxation as short term or long term capital gains which depends on the duration for which asset was there with you. For example, if you buy a mobile phone for 1 Bitcoin, which was worth $1200 when you bought the Bitcoin. But when you purchased the mobile phone the Bitcoin was trading at $1500, it means that you have purchased a dollar-denominated good (mobile phone) using another asset (Bitcoin) that is worth more in dollars than it used to be. Hence, the amount of Bitcoin in-use will be liable to taxation according to capital gains rules. One can cash out cryptocurrencies in two ways. One way is to sell the cryptocurrency that one had bought earlier. And the other is to sell the cryptocurrency one has mined. For the latter, one has to show the received amount as business income and the profit will then undergo taxation. And one can show inputs like PC and electricity as expenses in their mining operation. If cryptocurrencies cashed out were bought earlier, then standard tax rules of short term and long term capital gains are applied. For short term capital gain, one has to be aware of the basis price of the cryptocurrency. And the tax payable is equivalent to one’s income taxes. For long term (over 1 year) capital gains the govt. declared Tax Brackets (2019) is applied. Apart from the above mentioned taxable events involving the use of cryptocurrencies, one must also be aware of the non-taxable events. When traders buy one cryptocurrency with another, then they also become liable to pay taxes on the purchase. This is because they are buying an “asset” with another “asset”. For example, if you buy Tron using Bitcoin, it means that you are selling Bitcoin to buy Tron. And hence, one must note down the price of Bitcoin when you borrow it and its price when you use it to buy Tron. Also, note down the cost price of Tron. There are some platforms utilizing the smart-contracts of blockchain development services, which help in wealth management by organizing one’s assets on the blockchain. These platforms assist you with all the information needed to file your taxes. Cryptocurrency brokers need not issue 1099 forms to their clients. But the traders need to declare everything related to their cryptocurrency holdings and assets. We use Form 8949 to report the capital gains from selling, trading and using cryptocurrency. There are many online software available for such purpose. These can reduce your headache by assisting you in keeping a track of the fair values of the cryptocurrencies, tax implications, and latest developments. TrustVerse is one such platform which can help you in your digital wealth management. Also, a recent partnership of Zenledger with TurboTax can also help you in filing your crypto taxes providing you tax analysis in detail. 15th April 2019 is the official date which you should keep in mind for your tax filings. You should safely file your taxes following all the rules. Tax evasion is a federal offense. 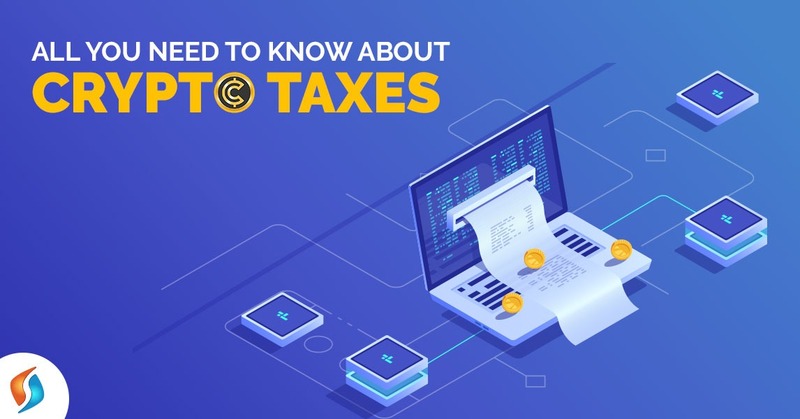 In case you are not clear on any part of crypto taxation, or you are not sure from where you have to start, it will be appropriate that you seek professional help from the tax advisors.